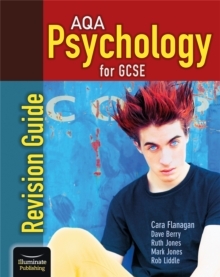 Written by Cara Flanagan and a highly experienced author team, this Revision Guide provides everything students need to know for their exams. // All the essential content for one topic - description and evaluation on one spread. // Invaluable exam tips. // `Apply it' questions allow students to apply their knowledge to a scenario question - some 'Apply it' questions focus on research methods. // `Knowledge check' questions are typical exam-style questions for that topic. // Suggested answers for 'Apply it' and 'Knowledge check' questions are provided as a free downloadable file. // Activities on every topic to improve exam skills and performance. // Two `write-in' activities on each topic help students practise and process the information on that topic. // All the activities are designed to help students correctly interpret and answer the exam questions. // Suggested answers for all the activities are provided as a free downloadable file.